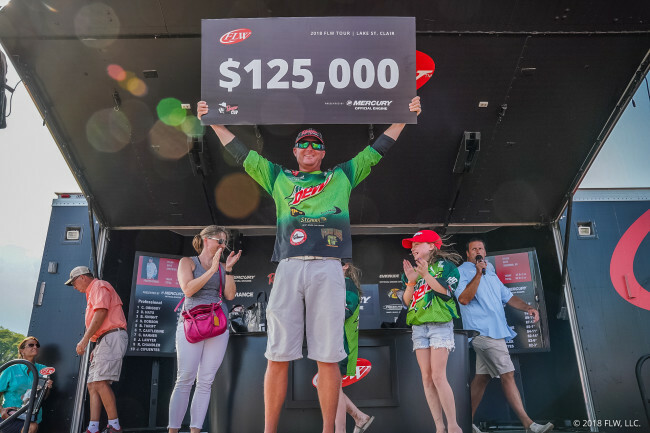 IBASSIN: Chad Grigsby Wins 2018 FLW Tour Lake St. Clair with 97-08lbs! Chad Grigsby Wins 2018 FLW Tour Lake St. Clair with 97-08lbs! Monster limit seals 2nd FLW win. Tube and spy bait devastating 1, 2 punch. That spot was a 1/8-mile stretch on the southern Canadian side of St. Clair. It wasn’t far from where Hays and Knight were sharing a spot, but having this particular spot to himself was what Grigsby feels made a huge difference in being able to pull out the win. While the spot didn’t seem like anything too different – an area with water 16 to 19 feet deep with a mixture of sand and patches of grass – what made it special was just how much bait was in there. Today, especially, Grigsby says when he pulled up he immediately noticed even more bait than had been in there all week. “I saw that and knew something special was going to happen,” Grigsby recalls. Just as in the previous days, Grigsby had to adjust to figure out what the fish wanted to eat. Willingness to adjust daily was the biggest reason for his victory. On day one, he was catching some fish, but when the lake slicked off he picked up a Duo Realis Spinbait 80 spy bait – something he hadn’t thrown even in practice – and cracked his tournament-leading 25-13 bag. The next day they wouldn’t eat the spy bait, and it was a switch to a 1/4-ounce black marabou jig that produced two big bites en route to maintaining his lead with 24-4. The spy bait was the deal again on day three, though Grigsby didn’t execute as well and lost a few fish that resulted in a 21-3 catch, which gave Hays an opening to slide into the lead. Grigsby knew that if he could execute better with the spy bait his weight would skyrocket back up on the final day, and he proved himself right. While he started catching them on a Venom tube, he mixed in the spy bait, which produced most of his bigger bites. The Minnesota pro grew up in Michigan and spent the first 25-plus years of his life fishing St. Clair, so Grigsby was confident he could win on the fishery. But he admits that confidence had wavered after the last few seasons. “I’ve had to overcome a lot of my own demons,” Grigsby says. “I’ve had such a bad last two years I didn’t even feel comfortable fishing anymore. I had no confidence.